When we adopted our Corporate Stance on Human Trafficking in 2008, the issue was not widely understood. Human trafficking was something happening overseas. Today, through the tireless work of many organizations and individuals, including our Sisters, the horrors of human trafficking are more widely known. Victims of human trafficking are having their voices heard more often. Governments and individuals in Canada and the United States have a better understanding that this is indeed a problem here at home. 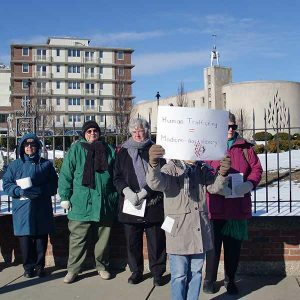 We, Sisters of Charity – Halifax, continue our commitment to eradicate human trafficking. We continue to educate ourselves and share that knowledge. We continue to advocate for victims, and to create supports for them as they rebuild their lives. At Bakhita House, where Sister Sally McLaughlin supports the recovery of women who have been trafficked by living in community with them. LifeWay Network opened LifeWay House 2, its second safe house in the New York City metro area. Founder and Executive Director Sister Joan Dawber and her team work tirelessly to educate the public, and to support survivors as they rebuild their lives. Residents of both LifeWay Houses and Bakhita House live in community with Sisters from various religious congregations. They are also connected to services that help them recover and start anew – services like legal assistance, medical and mental health care, education and job-skills training. Sister Nancy Brown continues her work in Vancouver, BC, raising awareness and helping young people, especially, transition to new lives. As a Board member with REED (Resist Exploitation, Embrace Dignity), Sister Nancy facilitated our partnership with that organization to create the Women Rising Bursary. This bursary is an opportunity for Aboriginal women who have been trafficked to further their career development through education. The Congregation has committed to providing $2,000 annually for 10 years. Thank you for the role you have played to help our Sisters move the issue of human trafficking into the light. Please join us once again in our efforts by making a donation today. There are still many people in trouble who need our help. “We can’t change the past, but we can listen deeply, with our hearts, to those who feel they can speak. … And we can work toward a future of hope, healing and right relationships with all.” Sister Donna Geernaert, Co-chair of Moving Forward Together Campaign. 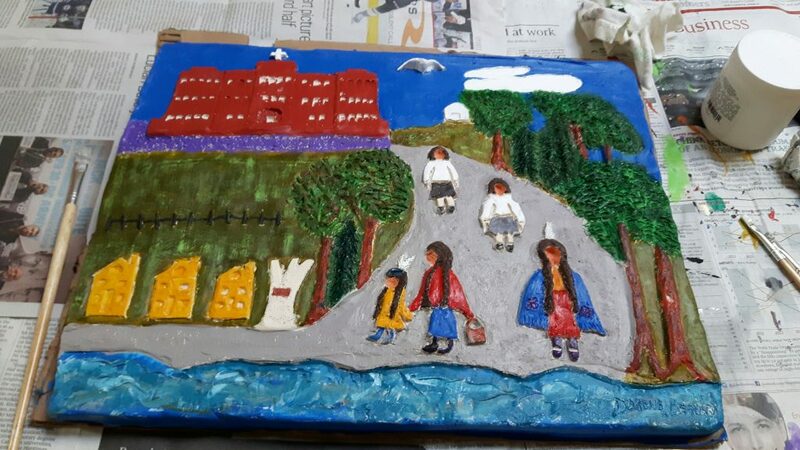 Our Congregation has participated in the Truth and Reconciliation process from the beginning, working with the Government of Canada on a comprehensive settlement of claims and on initiatives for healing, reconciliation and education. We have provided funding towards healing and reconciliation programs, and Sister Donna Geernaert served as co-chair of the Moving Forward Together Campaign for several years, helping to raise funds towards healing and educational programs. Several of our Sisters were actively involved in planning and participating in regional gatherings and national events. Five of our Sisters were part of the Returning to Spirit program, which consisted of two week-long reconciliation experiences. Looking forward, we have established two bursaries to help Aboriginal women. 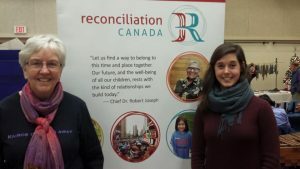 In Vancouver, BC, the Congregation has partnered with REED (Resist Exploitation, Embrace Dignity) to create the Women Rising Bursary for Aboriginal women who have been trafficked. Sisters of Charity have committed to providing $2,000 annually for 10 years. An Aboriginal Student Bursary has also been established at Mount Saint Vincent University in Halifax, NS, in the amount of $2,000 annually. The bursary will be awarded to an Aboriginal student, with preference given to a female returning to school as a mature student. We believe that all creation is sacred and interconnected, and interdependent … We believe that a small group of committees persons can help change the world. Our ministries and values reflect much that is found within the Earth Charter (which we endorsed) and the United Nations Millennium Development Goals and Sustainable Development Goals, and within Pope Francis’ Laudato si. All of these efforts are part of the larger work for the common good and the flourishing of the Earth. They pre-date Pope Francis’ Laudato si and its call for an ecological conversion of heart: “So what they all (Christians) need is an ‘ecological conversion’ whereby the effects of their encounter with Jesus Christ become evident in their relationship with the world around them. Living our vocations to be protectors of God’s handiwork is essential to life of virtue.” By joining the millions of others engaged in this work, we bring light and hope to our earth and all of creation. The Sisters of Charity-Halifax have a long history of working with others to ensure that all of our financial decisions and investments are values-based. For instance, the Congregation has been an active member of the American ICCR (the Interfaith Center on Corporate Responsibility) for many years and more recently, of SHARE (Shareholder Association for Research and Education) in Canada. ICCR is celebrating its 45th anniversary this year. It is a pioneer coalition of shareholder advocates who use investments for social change. Its members include faith communities, socially responsible asset managers, unions, pensions and NGOs with combined assets of $200-billion. Focus areas include climate change, water stewardship, human trafficking, health care and food production. Some of our recent actions include signing on to a statement on the Dakota pipeline and the effect it would have on the Sioux Tribe, and another supporting affordable health care legislation in the US. We have also been able to pursue transparency in the business supply chain and its impact on human trafficking. Through our membership in ICCR , SHARE and regional groups, we are able to maximize our power, to have our voices heard and to have a greater impact. How does one know the effect she has on another while she lives? … we have nothing to fear.